My love affair with Japanese crime fiction continues with this beauty by Keigo Higashino who may be better known for his Detective Galileo series, which begins with The Devotion of Suspect X, a brilliant crime story. Malice features a different police detective and his name is Detective Kaga. According to Wikipedia, this is the fourth book in the series but the first three don’t seem to have been translated into English as yet. The Galileo series has faired better in terms of publication, with three out of four being published. Hopefully more of Higashino’s works will be translated. Because he has such an amazing way with plot twists. Bestselling novelist Kunihiko Hidaka is found dead in his home. A paperweight has been used to bludgeon him. In case that wasn’t enough, he has also been strangled. His body is found by a fellow author, Osama Nonoguchi, who writes children’s books, and Hidaka’s wife Rie. Hidaka was in his locked office. He and his wife, whom he had recently married, had been about to make their move to Vancouver, Canada, to start life anew. This is quite a puzzle for Detective Kyoichiro Kaga, who happens to have known Nonoguchi when they were both teachers. What is especially intriguing in this mystery novel is that the guilty party is arrested early on in the story. But Detective Kaga continues to puzzle over the case and digs far deeper and deeper until he finally figures it out. I loved the plot of this story. It’s hard to talk about it without giving much away. It definitely made me sit up in awe of the way Higashino twists and turns his plot around. Malice was a quick read and it was entertaining with its plot puzzle. 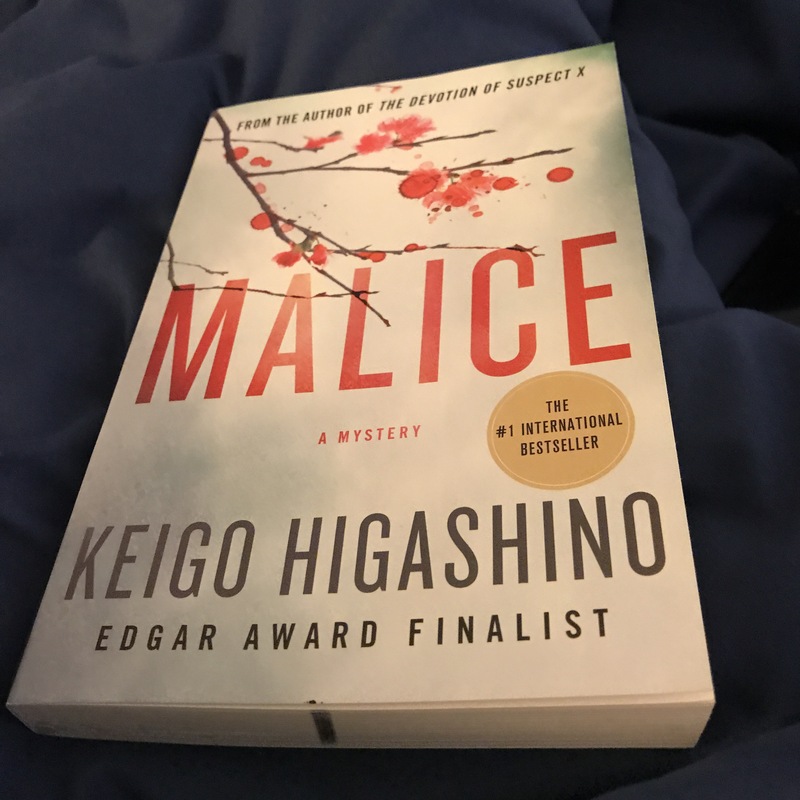 But I think Higashino’s other books like Under the Midnight Sun and Devotion of Suspect X are better reads, more elegantly written, than this one which, while decently written, wasn’t quite as stellar. Higashino nonetheless is one Japanese crime author I always look out for. I just wish I wasn’t at the mercy of American publishers and the way they pick whichever books to translate!